Activist Bree Newsome scaled a flagpole and removed the Confederate flag from a monument at the Statehouse in Columbia, S.C., following a deadly shooting at a historically black church in Charleston. The flag was officially removed from the grounds days later on July 10. 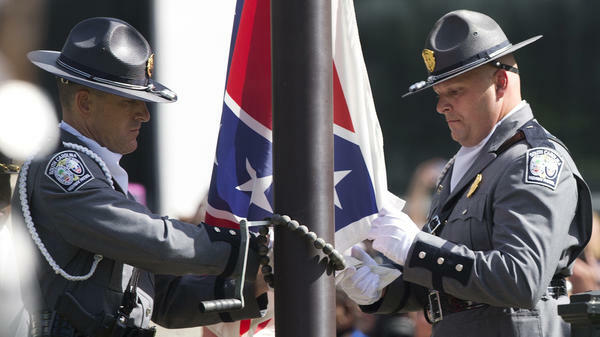 An honor guard from the South Carolina Highway Patrol lowers the Confederate battle flag on the grounds of the South Carolina Statehouse on July 10, 2015. Memorials to Confederate leaders like Thomas "Stonewall" Jackson, pictured, Jefferson Davis and Robert E. Lee line Monument Avenue, a stately historic street in downtown Richmond. Mississippi's state flag includes a Confederate battle symbol. 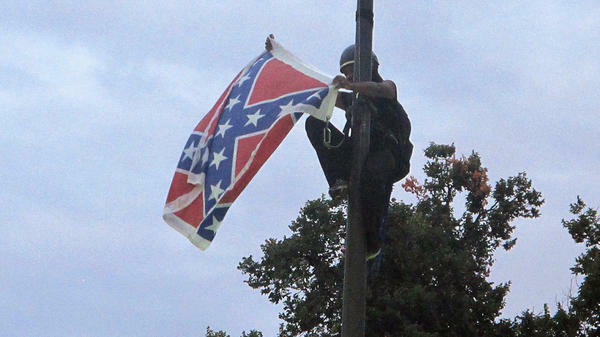 Under a clear sky on July 10, 2015, the Confederate flag that had flown on the South Carolina statehouse grounds since the Civil Rights era came down. That decision by state leaders — called for by black activists — followed the murders of nine people at a historically African American church in Charleston by a white supremacist who'd been photographed posing with the Confederate flag. One of the most controversial decisions happened in New Orleans, where four monuments honoring the Confederacy and white supremacy came down earlier this year after tense protests. That decision was supported by New Orleans Mayor Mitch Landrieu — the city's first white mayor in more than 30 years. "This is a history we should never forget and one that we should never, ever again put on a pedestal to be revered," Landrieu said in a speech praising the monuments' removal. Over the weekend in Charlottesville, Va., about 1000 counter-protesters surrounded a few dozen KKK members who'd come to town to demonstrate against the planned removal of a statue of Confederate General Robert E. Lee. That was just the latest of several local disputes and over the issue. In one of the former capitals of the Confederacy – Richmond, Va. – the city's young, African-American mayor is trying to compromise. 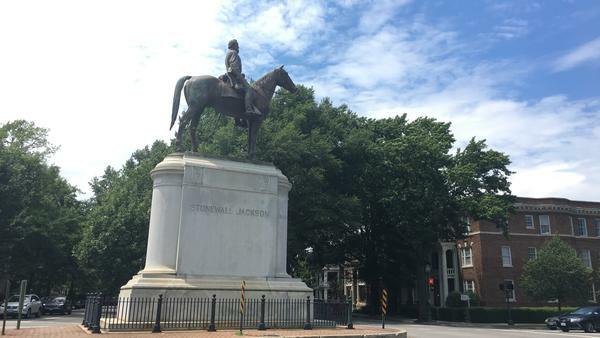 Mayor Levar Stoney recently created a commission charged with finding ways to contextualize memorials to Confederate leaders like Jefferson Davis and Robert E. Lee that line Monument Avenue, a stately historic street downtown. Stoney has suggested adding signs to explain the markers' history or new statues honoring other historical figures. "Removing monuments doesn't change race relations in our city; I'm just as insulted by those statues as anyone else," Stoney said at a press conference discussing the commission. "But what I'm most insulted by is the fact that those statues currently stand up there without telling an ounce of the truth." Baltimore's Mayor, Catherine Pugh, has said she also wants to explore removing the city's monument to several Confederate leaders. Her predecessor, Stephanie Rawlings-Blake, had ordered interpretive signs to be placed alongside the monuments, a move she described as a short-term solution at the time. 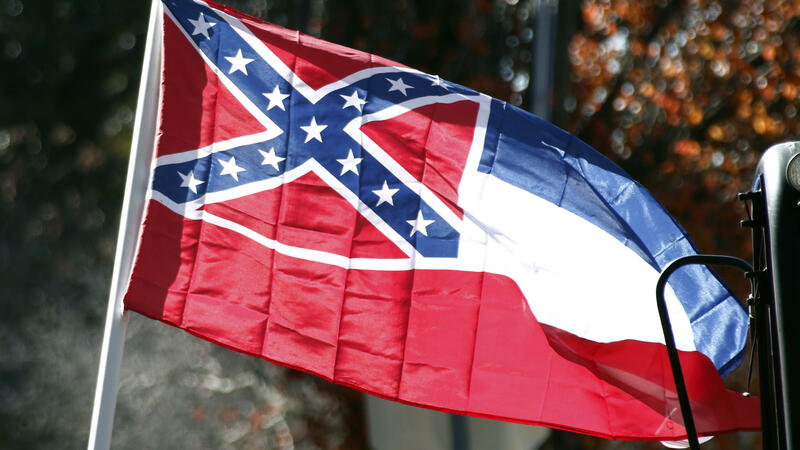 Mississippi's state flag still incorporates a Confederate battle symbol into its design. For that reason, the city of McComb recently stopped flying the flag – over some local objection. A black Mississippi resident, Carlos Moore, is challenging the flag in court, arguing that it is a symbol of white supremacy. And the University of Mississippi announced this month that it will put up a sign recognizing that some campus structures were built by slaves. In Norfolk, Va., in late May, someone spray-painted the word "SHAME" in giant letters across the city's monument to the "Confederate Dead," which is positioned prominently downtown. Rayla Young of Virginia Beach was walking by as a city crew cleaned off the paint. Young, who's African-American, said she's resigned to the statue's presence. "I just walk past it like I don't even see it ... Of course it hurts, but I mean, there's nothing that I can do to tell anybody to take it down," Young said. Steve Turner, a white construction worker from North Carolina's Outer Banks, was also passing by. He said there's no need to stir up controversy about things that happened in the past. "I mean, everything's offensive nowadays. It doesn't matter what you do or what you say, it's still offensive," Turner said. "But it's American history – it should be left alone." "I hate to say it, but you know, it's getting so bad we are the minority now ... white people are," he said. "Since Obama took over, back then, that's what created all this crap right now." Whatever cities do with their Confederate symbols, there will still be deeper racial issues for the nation to confront. Brandy Faulkner, a political science professor at Virginia Tech who studies race and public policy, also points to President Obama's election as a turning point that sparked racial resentment among some white Americans. "We like to think that we've made so much progress in this area, when in fact we haven't made very much at all. And what happens is the level of resentment grows depending on the visibility of progress," Faulkner said. "So with the election of Barack Obama, we had, for the every first time, a visible symbol of the nation that was African American, and I think it was a shock for so many people." Faulkner says taking down monuments, or adding context to the ones that stay up, may temporarily settle local debates – but the larger conversation about race in America is far from over. "We have yet as a country to be honest that we are still having a race problem, and until we can have that discussion openly and honestly, I don't think there will be a resolution," Faulkner said. Over the weekend in Charlottesville, Va., a few dozen members of the Ku Klux Klan were faced down by about 1,000 counter-protesters. The KKK had come to demonstrate against the removal of a statue of Confederate Gen. Robert E. Lee. Now, this clash comes almost two years to the day after South Carolina took down the Confederate flag over its statehouse. And that followed the murders of nine people at a historically black church in Charleston by a white supremacist who had been photographed posing with the Confederate flag. Cities across the south and beyond have been grappling with what to do with their Confederate symbols, as NPR's Sarah McCammon reports. SARAH MCCAMMON, BYLINE: In many cities, statues honoring Confederate leaders and generals and soldiers killed in the Civil War have stood for decades or longer. Calls to remove them - and with them, reminders of racism and slavery - are sparking debates about identity and history in communities from Tampa to St. Louis. MCCAMMON: Some of the most contentious protests have taken place in New Orleans, where four memorials came down earlier this year. That move was advocated by Mayor Mitch Landrieu, New Orleans's first white mayor in more than 30 years. MITCH LANDRIEU: This is a history we should never forget and one that we should never, ever again put on a pedestal to be revered. MCCAMMON: For cities where Confederate history already rests on multiple pedestals, there's no formula for what to do next. In Richmond, Va., which was once one of the capitals of the Confederacy, the city's African-American mayor, Levar Stoney, recently created a commission charged with finding ways to contextualize several memorials that line Monument Avenue, a stately historic street downtown. LEVAR STONEY: Removing monuments doesn't change race relations in our city. I'm just as insulted by those statues as anyone else. But what I'm most insulted by is the fact that those statues currently stand up there without telling an ounce of the truth. MCCAMMON: Stoney has suggested adding signs to explain the markers' history or new statues honoring other historical figures. Sometimes, protests over Civil War monuments take the form of a can of spray paint. In Norfolk, Va., several weeks ago, someone wrote the word shame in giant letters across a monument to the Confederate dead positioned prominently downtown. Rayla Young of Virginia Beach walked by as a city crew was cleaning off the paint. Young, who's African-American, said she's more or less resigned to the statue's presence. MCCAMMON: Do you think it should be here? MCCAMMON: Steve Turner, a white construction worker who'd come into town from North Carolina, was also passing by. He says Confederate symbols are part of American history and should be left alone. STEVE TURNER: Well, I mean, everything's offensive nowadays. It doesn't matter what you do or what you say. It's still offensive. MCCAMMON: The country is becoming increasingly diverse. And Turner believes that's causing problems and creating controversy. TURNER: I hate to say it. But, you know, it's getting so bad, we are the minority now, you know? TURNER: White people are, you know? And they're - to say - since Obama took over, back then - that's what created all this crap right now. MCCAMMON: Whatever cities do with their memorials to the Confederacy, the nation still faces deeper racial divides. Brandy Faulkner, a political science professor at Virginia Tech, says Obama's election fueled racial resentment among some people. BRANDY FAULKNER: We like to think that we've made so much progress in this area, when, in fact, we haven't made very much at all. MCCAMMON: Faulkner says removing Confederate monuments is a step in the right direction. But until the country has an honest conversation about its racial history, those actions alone won't solve the larger problem. Sarah McCammon, NPR News, Norfolk, Va.
(SOUNDBITE OF AS THE POETS AFFIRM'S "THALIA") Transcript provided by NPR, Copyright NPR.